Ruling Classes Subjugate Opposition With Irrationality, Not Just Human Sacrifices (And Their Variants: Killings, Jihad, Signature Strikes). Say you are a tyrant, You want Your rule as absolute as possible. You may have ecological problems, and you may need to decimate your subjects, or make them work harder. What is the best way to do this? Controlling your subjects’ minds, and not just with fear. Notice the sheep: they follow the pastor who milks them, and occasionally, cut their throats. What is the difference between flock and pastor? The pastor is much more clever, much more rational. The pastor is endowed with reason. Actually more than one. The pastor is full of reasons. The sheep is deprived of reason. Irrational. So, as a tyrant, irrationality you shall preach. So how are you going to turn simple folks into a flock deprived of reason? Well, human sacrifices are a way to do this. Notice the king in the drawing below, sitting under an umbrella, just like a US president under his White House. A study published in Nature, in April 2016, explains that “Ritual human sacrifice promoted and sustained the evolution of stratified societies”. 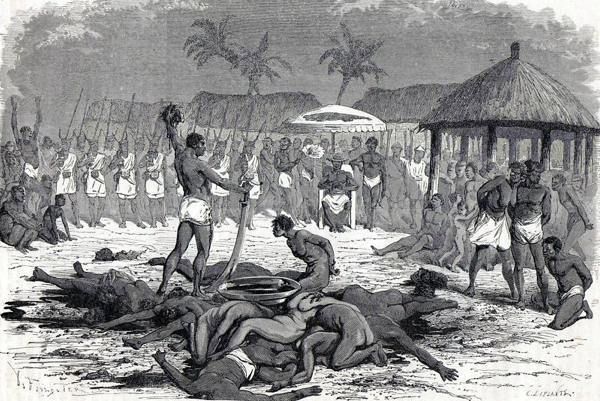 The “Annual Customs” in Dahomey were also tax day for the free citizens of Dahomey (only war captives and criminals were sacrificed). The massive (several thousands) sacrifices stopped when the slave trade became too irresistibly profitable (the empire of Dahomey provided roughly 20% of the transatlantic slaves). Honored European guests were allowed to attend the Annual Customs, as Dahomey had guns made locally, a professional army, and was perfectly capable of defending itself against the white man (as the British army found out, in Ashanti next door, suffering a terrible defeat where all soldiers were killed, but two, and the Anglo-Saxon commander was eaten, cooked like Cook). Adore irrationality, reject reason. Rejecting reason, makes one the master’s slave, because one becomes so stupid, one gets feeble-minded. Thus all enslaving religions trample reason, as reason is the weapon which could destroy them most. Reason, not love. This is why all religions which help enforce plutocracy train their followers to obey senseless orders, such as not eating pig, crustacean, and only eating animals who were agitated by spasms, while experiencing anxiety and suffering as their throats were slit, etc. One should not forget a Prophet who flew to Jerusalem on a winged horse, before ascending to heavens, just like that other guy had done before. 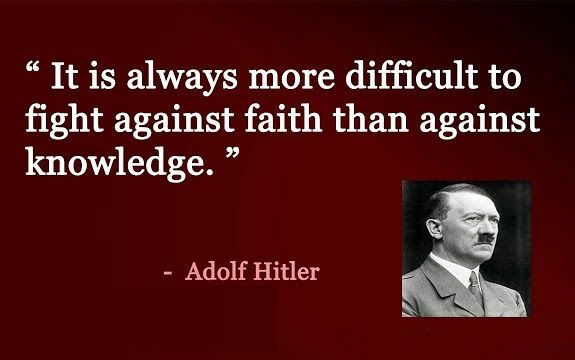 Superstitious religions sound very stupid, but the cult of unreason has its reasons that only the masters understand. Some of these orders are not just irrational, they are lethal: if they can claim you insult(ed) their little godly doggie god in the sky the excellent Judeo-Christiano-Muslim authorities could, or would outright order you killed. Hence irrationality did not just rule, it killed, and demanded the utmost respect, doing so, lest it would have another irrational reason to kill you. Let me insist: the very irrationality of religious commands enables the authorities to exert power whimsically. So it is the reign of Sharia, not Human Ethology (the later been approached by Roman law). In the third century BCE, Chinese administrator Li Bing eliminated the sacrifice of young maidens to a river god during the conquest of Sichuan by the First Emperor. He called the bluff of a local racket in which families rid themselves of unwanted daughters while getting rich on the compensation they received. Thus “irrational” rituals bring all too rational, very prosaic gain. As we just saw, “irrational” beliefs are something else reason to get ahead. Pure irrationality is rare. Searching the reasons behind apparent irrationality, what’s hiding in the Dark, oft reveals causality in full. Jared Diamond rejects the explanation that believing in irrational things is just due to ignorance. Instead he views it as necessary for identifying in groups. There is no doubt that this is a factor. But one does not need sheer absurdities to identify in a group. Middle Age Muslims for example requested Jews and Christians to wear clothing which could identify them. So dressing in a special way can work. Well, sorry Jared, that’s mostly missing the point. There is a higher reason for imposing (the religion of) irrationality. The point is that irrationality makes people brainless, and thus easy to rule. However, humans are naturally rational. So irrationality has to be taught, and preached. Some may sneer and ponder what’s in it for We The People. Why would We The People be so easily seduced by their own subjugation? So what We The People get in exchange is… irrationality, a rest from the human condition. And just like the Lords themselves, brandishing irrationality to generate fear, cruelty, submission… We The People can do the same. In almost all societies, killing “legally” within a tribe or clan is granted only to those with great authority. Thus ritual human sacrifice serves power structures—who sits at the top of the social hierarchy. In a study published in Nature, Joseph Watts, a specialist in cultural evolution at the University of Auckland in New Zealand, and colleagues analysed 93 traditional cultures in Austronesia (the region that embraces dozens of thousands of islands in the Pacific and Indonesia). The key was to analyze them before they were influenced by colonization and major world religions (generally in the late 19th and early 20th centuries). Ethnographic records, show that the prevalence of sacrifice increased with increased social stratification: it occurred in 25% of cultures with little or no stratification, 37% of those with moderately stratified societies, and 67% of those with a pronounced hierarchy. Mapping the evolutionary relationships between cultures, the researchers found that human sacrifice and social hierarchy co-evolved. Social stratification can change over time. However, societies that practised human sacrifice were less apt to revert to milder degrees of stratification. I hold that extremely lethal Jihadism is a form of human sacrifice, so this analysis carries to Literal Shia or Salafist Wahhabist Islam directly, and explained why these Muslim societies were unable to progress. Human sacrifice is the privilege of priests or those who claim religious authority. Watts and colleagues say that this discloses a “Dark Side” to the social role of religion. (They have previously shown that belief in supernatural punishing agencies in Austronesian cultures encouraged moral observance, and thereby promoted the emergence of stratified, complex social structures). Watts’s team reveals that human sacrifice wasn’t conducted for ostensibly religious reasons alone. Taboo violations, demoralization the underclasses, imposing class boundaries and instil fear of social elites, all build and maintain social control. In India, Untouchable touching higher caste individuals could suffer what are nowadays unimaginable punishments such as amputation, sitting in a red hot metal seat, etc. Say You are a tyrant, You want all to understand that Your rule is absolute, global as the plutocracy you lead with relish. So You order “Signature Strikes”, thus telling the world that any wedding You can kill, if such is Your good pleasure, as long as it happens in a far away land. Were the killing by drones in “signature strikes” personally ordered by president Obama for all to see a form of ritual killing, of human sacrifices for all to see? Certainly. The scariest part is that ordering kills for all to see is something that even Chancellor-President Hitler, a solid reference for human sacrifices, was careful not to be associated to! This means that the Obama administration developed momentum to change the public’s mind about human sacrifice. Human sacrifices violate human ethology, the evolution-given morality humans come equipped with. In the small groups in which humanity evolved for millions of years, human life was most precious, because the life of others was necessary to pursue one’s life. So this means that the rise of civilization and its accompanying religions comprised a violation of human ethology. The main theme of this essay is even more general: it considers not just the violation of evolution given morality, by “stratified societies”, but the violation of reason itself. Violating reason itself compounds the preceding moral problem: human ethology does not come just from “instincts” (whatever that means), but also from the usage of rationality (within a culture, or the individual). 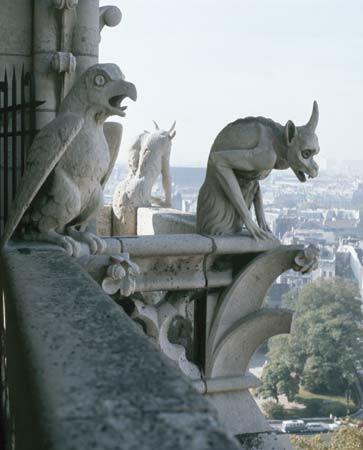 The superstitious religions associated to the rise of demonic upper classes, plutocracy, have attacked reason itself. They are as inhuman as one can get, and survive. They enabled war maximally, annihilating their competition fully (although secular Rome and Literal Islam have unfinished business). Superstitious religions come short, for the future. Their carefully engineered irrationality and willingness to kill at the drop of a hat, will decapitate us, if we do not decapitate them first. Make no mistake: irrationality has its uses, it allows to jump out of mental boxes. However, irrationality in a religion is different; it creates a common box, and create common, shared respect for irrational elements. Adoration for the Golden Calf is itself a particular case of irrationality. Making irrationality itself an object of adoration is a generalization of the cult of the Golden Calf, to the point of adoring the whims of the satanic masters themselves. Collective adoration of senseless ways is collective adoration for the mania of the crowd, intellectual fascism at its worst. It’s a moral duty, moral from the ways of Homo, moral to go back to the free ways of our genus, which have made us what we are, the crown of the creation of reason, by enforcing reason, and not its exact opposite.